SMMS Metal Detectors for Frozen Food are compatible with international standard quality check norms, Ideal to use for Frozen food applications very essential machinery in compliance process, Compatible to wet wash factory environment. 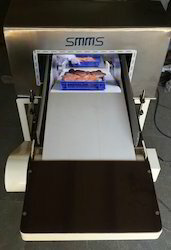 SMMS Metal Detector for Frozen Seafood delivers accurate results with minimum amount of wastage in final product line, meeting high demands in sea food export industry. We at SMMS understand high requirements in frozen food industry and after constant research and development process we have develop machines which are high on performance, and highly adjustable to moist factory environments. 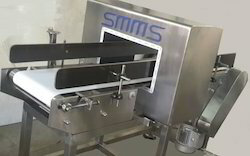 SMMS Metal Detector for Frozen Meat uses internationally technology to be compatible in standard with international quality check norms, Ideal to use for Frozen meat processors in export market, Very essential machinery in compliance process, Compatible to factory environment, specially types of belts and special type of built In material used for wet products such as frozen meat, frozen seafood, frozen vegetables. We are leading supplier of Metal Detector with Conveyor for Frozen Sea Food. A specially designed Model for packed food & Frozen Sea Foods. These are Tailor made machines as per various applications. With different types of Rejection Systems. We offer wide range of Frozen Food Metal Detector. Metal Detection systems are essential machinery for compliance of Ready to eat food or frozen food manufacturers, it is very essential to check products in various stages through metal detector and ensure complete safety of products. 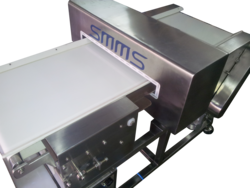 SMMS Metal Detectors are manufactured as per HACCP standards of protection, A state of art design which delivers accurate detection results with minimum wastage of product and high performance.